PRESCOTT, Ont. — When the snow melts, Robert Lavergne will be riding high on the hawg. 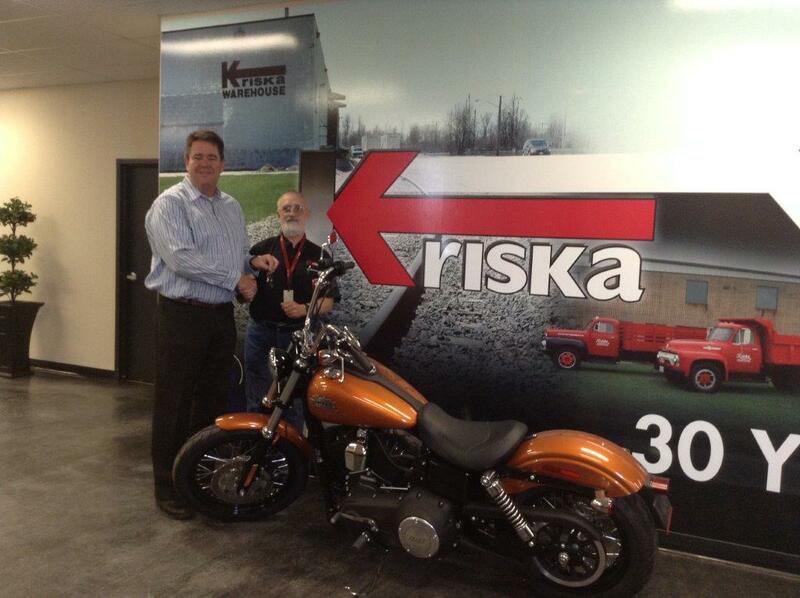 The professional driver for Kriska was just awarded a Dyna Street Bob Harley-Davidson for winning the company’s first Fuel Reduction Challenge. The Harley, valued at about $17,000, went to the driver who demonstrated the best fuel economy improvement over the course of the past year. Drivers were divided into categories based on equipment type and route and then compared against their peers, explained Denise Elliott, Kriska’s safety manager. Jonathan Wahba, chief operating officer at Kriska, agreed. “I’m especially pleased for Robert, who generated some truly remarkable results for the company this year, and is now the well-deserved and proud owner of a brand new Harley,” he said. Robert Lavergne, right, is handed the keys to a new Harley Davidson by Kriska boss Mark Seymour. Kriska came out a winner as well. Elliott said the program helped the company reduce its fuel consumption by nearly 0.1 miles per imperial gallon in 2014, presenting a total savings of about $1.1 million based on $4 per gallon and 33.7 million miles run. Its fleet-wide fuel consumption improved from 7.05 miles per imperial gallon in 2013 to 7.51 in 2014. Of course, Elliott said some of this savings can be attributed to newer, better-spec’d trucks, driver training and other variables as well. However, Kriska is convinced the Fuel Reduction Challenge played a role and is fine-tuning the competition for 2015. In an effort to make the contest appeal to a wider population of drivers – including those who don’t ride – and to level the playing field further, it is adjusting the rules. The top 10% of drivers in every category will receive $25 gift cards each month, as well as a ballot they can enter into a ballot box. At the end of the year, a $10,000 grand prize will be awarded to whoever’s name is drawn from among the previous winners.